Last weekend, 1-2 July, I was fortunate enough to be attending a two-day bee workshop led by pollinator expert Steven Falk at the Rye Harbour Nature Reserve near Rye in East Sussex. Throughout the weekend we were blessed by an incredible diversity of solitary and social bee species alike, with around 50 species of the Apoidea being found during the weekend. However, one species that caught my eye wasn’t in fact a bee. Covering the sandy paths at some points were a multitude of wolves, excavating burrows and looking for their next meal. They prowled along the tracks and up the sandy slopes, concentrating their efforts on the path-side bramble bushes. This is where their prey is most often found feeding, unaware of the wolves sneaking up behind them until they latch on with a relentless bear-hug. Of course, the wolves I’m talking about aren’t the canids that roam remote areas of Eurasia and North America. Just as fierce, however slightly smaller, are Bee Wolves, Philanthus triangulum. Bee Wolves are the largest solitary wasp in Britain and they need to be in order to tackle their favoured prey: honey bees. Bee Wolves used to be not only the largest but also the rarest solitary wasp in Britain. However, since a couple of decades ago, their population has been on the increase and they’ve spread to a number of new sites. Their numbers are not as large now as they were a few years ago, however there are still more about than there were 25 years ago. It’s great that these fascinating insects are more widespread now as they’re incredible to watch. They weren’t too scared of humans at all, in fact we were able to watch with such proximity that on a couple of occasions one actually landed on Chris Glanfield’s phone while he was trying to take a photo! Being solitary wasps, they each dig their own long burrow. These burrows contain many small chambers, as many as 30, each containing several bees. In each chamber an egg is laid, and when it hatches the larva feeds upon the bees inside the chamber before emerging as an adult Bee Wolf. The bees are not dead but paralyzed as it helps them to keep fresh and juicy for the developing larva. We were lucky to be able to watch several wasps excavating and entering their burrows as well as carrying their prey around. This was the first time I had ever seen a bee wolf and I’m hoping I get another opportunity to watch them before too long! A Bee Wolf proudly outside an unfinished burrow I watched her excavate in only about 10 minutes! Yesterday I was very lucky to be able to spend a full day at Knepp Estate in Sussex, one of my most favourite sites to visit. We arrived early, at 6am, for some bird ringing to start off the day. Yesterday we were using a new bird ringing site on the estate, after success at the A Focus on Nature event recently when several Lesser Whitethroats were caught, a bird I have only ringed once before. None were seen let alone caught yesterday, which is very odd. Perhaps they have started to migrate already, however it is still quite early for the Sylvia warblers to be on the move. Maybe they just moved to a new part of the estate. The highlight of my ringing morning was catching my first Sedge Warbler. This was a very peculiar catch! That is because although there are a number of waterbodies at Knepp, no Sedge Warblers breed here. This individual was a juvenile, which explains it. At this time of year, juveniles are dispersing, leaving the sites where they hatched and grew up. Soon we might even be able to catch adults as they stream south to winter in Africa. Soon after the ringing we had to leave to a different area of the estate for a bee field trip which I was very excited about. It was organised by the Amateur Entomologists’ Society (AES). I attended a similar one at Knepp last year which focused on grasshoppers and crickets. When the field trip got going we were surprised at small numbers of bees that we were finding. Knepp Estate is a great habitat for bees with many different flowers which cater for the different tongue-lengths of bees. For instance, long-tongued bees such as the Garden Bumblebee (Bombus hortorum) are able to feed on Foxgloves and similar plants whereas short-tongued bees like the smaller solitary bees can only feed on flat flowers such as mayweeds and daisies. There are also lots of great nesting habitats for bees, such as fence posts, old lightning-stricken trees and farmyard walls. So why were the bee numbers so low? The two most likely reasons are due to the weather. On the day it was very cloudy and dull, poor weather for bees to be out and about as they need to warm up in the sun before they can fly. Also, it has been a very poor season as a whole for them. June was a very wet and cold month, severely hindering the opportunities where bees could go out and collect pollen and nectar. Despite the lack of bees, invertebrates of many other orders were well-represented and we spent time recording and marvelling at those as well between looking for and at bees. One thing that we all noticed were the incredible abundance of Cinnabar moth caterpillars. Their foodplant is Ragwort, and there are thousands and thousands of them at Knepp. In fact, it is the most abundant plant by quite a long way and most plants seemed to have several caterpillars devouring their foliage. Many plants were completely devoured apart from their stem and we found instances where a group of caterpillars had munched their way through one ragwort plant and had moved to another. When it became particularly cloudy and there were no bees in sight, I became especially interested in finding grasshoppers following the field trip last year. Ralph Hobbs led the event last year and was here again this year and together we found quite a few. We noticed that on the inside side of the ‘thigh’ of the back leg of the Lesser Marsh Grasshoppers we caught there was a dark mark that we also found on Field Grasshoppers. Meadow Grasshoppers are the main confusion species for the Lesser Marsh Grasshopper and they seem to lack the dark mark on the leg. Ralph and I reckon that we have found a new identification feature to separate these two similar species, however more specimens will have to be caught and looked at before we can say that the dark mark is a completely reliable separation feature. We stopped for lunch at a good site, it seemed. After I had finished my lunch I went exploring in the general area and there were lots of interesting creatures to be found. There were a large number of marsh flies (Dolipechidae) on and by a large muddy puddle, the species is easily recognised by the white tips to the smokey wings. These white tips are especially prominent in the males, which use them to display to the females. It is quite entertaining to watch, especially when a female rejects a male! Surrounding the lunch site there were many willows (Salix sp.) and some large Oaks. This is great habitat for Purple Emperors, so we kept our eyes peeled. I had already seen a couple a few weeks ago (blog post here) but I wouldn’t mind seeing another! Amazingly, I didn’t have to wait very long, I was kneeling down looking at a large Toad that had somehow found itself beneath a tight stone when I heard ‘Purple Emperor, just landed! Purple Emperor, just landed!’ coming from down the track. Of course I leapt up and ran towards where the exclamations were coming from. Some of attendees of the field trip were looking confused as our leader, Josh Nelson, tried to point out the magnificent butterfly to them. It was surprising how difficult such a large and impressive butterfly was to spot! The reason was because it was side on to us all, therefore we could only see a sliver of black and white against the oak leaves behind it. I must admit that it did take me a while to find it but once I did I was attempting to show others the butterfly which proved to be a very difficult task, although they all got onto it eventually. There it remained for a while before a ‘Purple Hairstreak’ (definitely not our leader Josh! ), flushed it from the oak leaf it was sitting on. We were able to get our best views then however, as it fluttered over the nearby sloe bush and out of sight. See if you can spot the Purple Emperor! So, when everyone was ready we decided to leave the area to see if we could find some bees, although that didn’t really go to plan. We actually only walked approximately 5 metres before we stopped again! This time we heard the calls ‘Purple Hairstreak, landed! Purple Hairstreak, landed!’. Once again, I rushed towards where a group of people were leaning over peering at something on the track. There, on the bare dirt, was a beautiful female Purple Hairstreak, with patches of stunning iridescent purple on the wings. This was easily the best view of a Purple Hairstreak I have ever had. Before I have only seen these small butterflies up at the tops of hedgerows or flying several metres above the ground. So what was this Purple Hairstreak doing on the ground, exposed and with its eyecatching wings open for all to see? It was as if it was saying ‘come eat me, I’m tasty’! Closer inspection revealed that she was indeed pregnant, and appeared to be very weak because of that. After obtaining some quick photographs we managed to get the hairstreak onto someone’s hand and Ralph poured some of his (non-alchoholic!) elderflower cordial onto his fingers. To our delight, the butterfly’s proboscis came out and it started to feed on the cordial! It soon gained energy and we placed it on part of a nearby oak tree which would catch the morning sun and where it would hopefully lay its eggs. Below are some of the photos I managed to take of this beautiful butterfly. Soon we did move on, however, and now that we had our eyes in, we began to spot some more bees and other wildlife. One of the richest habitats of Knepp Estate is the grassland which is peppered with some scrub. On the sandy track through the grassland there is plenty of mayweed, a flower that is similar yet much larger than daisies. There were a few small dark bees, although however much we tried we were unable to catch any to identify them. The track was also riddled with some small circular holes, which were the nests of these small black solitary bees. Eventually, eagle-eyed Josh spotted one on the ground by its nest and swiftly potted it so that he can identify it back home. The nests in the sandy soil gave us another idea for why there were few bees about. Perhaps the unnatural number of cows, pigs and deer on the estate were constantly trampling on these nests and destroying them. That might be one downside to the rewilding project, although it is restoring habitats to what they were like in prehistoric times, so perhaps bee numbers were this low millenia ago? Our final stop before heading back to the car park was the outflow of mill pond. The edges of the outflow were rich in aquatic and water-associated flora such as Purple Loosestife, Yellow Loosestrife and Water-plantain. Josh told us that there was a bee that has specialised to exploit Yellow Loosestrife. 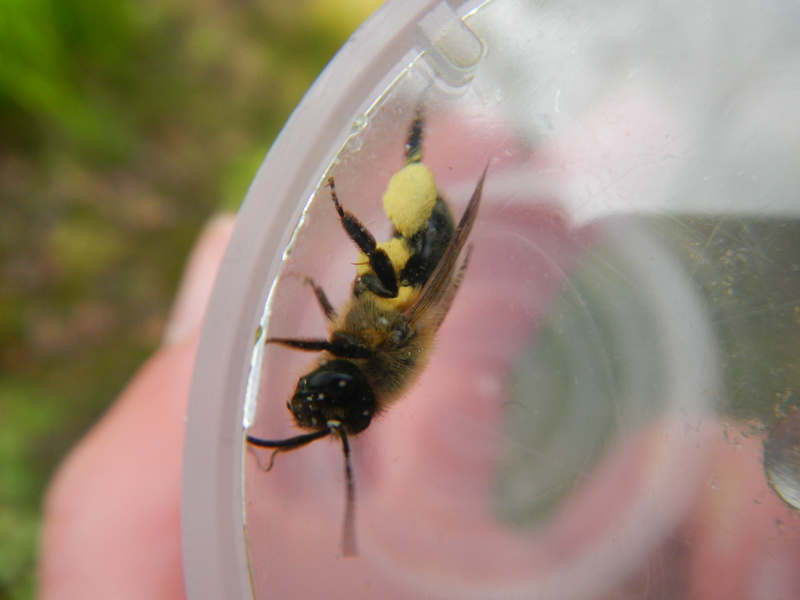 Unsurprisingly it is called the Yellow Loosestrife Bee (Macropis europae) and it collects the oils from the Yellow Loosestrife flowers to water proof its nest. This allows it to nest in very wet places where other bees are unable to nest. Just as Josh was saying this, Ralph called ‘is this the bee?’. Josh potted it, had a look at it and confirmed that it was the bee! Amazing! This bee is easily identified by its distinctive black and white hind legs. Well, there wasn’t a huge number of bees at Knepp that day, although I really enjoyed talking to other naturalists as well as recording other wildlife that I came across. I can’t wait to visit Knepp Estate again! This morning I walked along Mill Lane which runs along the east side of Hedgecourt Lake. What struck me first was the height that the Water Dock had grown to compared to the last time I visited the lake. It was at least the height of me if not taller. This is not unusual though, some plants can grow to more than 2 metres. This plant can grow in very tough conditions, these ones grow on the concrete wall of the lake against the hard wind and the severe waves that sometimes form. Equally large were the leaf mines that covered almost half of each leaf. Some leaf-mined leaves were about 75 centimetres long, so the leaf mines were huge! Whose larvae are growing up inside those leaf mines? I went to the Rumex (Dock) section of the site and I saw that luckily there are not that many leaf mines on Dock in Britain. From the photos on that page I think that my species is Pegomya solennis. Pegomya solennis is a species of fly, unfortunately not new for my list although very impressive. This species is not a large fly, but the key to its very big mines lies in teamwork. In each mine there are two or more larvae that at first work together making a wide corridor. They then separate and each form a large blotch which all fuse together making one large blotch from which they feed. Sometimes the blotch size is increased even further when the blotch joins the blotch from a different leaf mine. The larvae feed on the leaf from inside these blotches. Along the grassy verge between the lane and the lake there are several large patches of Bird’s-foot Trefoil, Ribwort Plantain and Black Medick. I thought these large patches might hold some specialist species but alas not much was swept from them using my net. The only species of interest was a single Platycheirus peltatus, a species of hoverfly and my 94th fly species on my Pan-species List. The white spherical object in the centre of the hole is an egg sac, which belongs to a very large spider. I tried to coax it out from the hole, but it wouldn’t come. I’m not certain what it is, but one possibility is the mouse spider, Scotophaeus blackwalli. However it is usually found in sheltered places indoors so I’m not sure what it is doing on this exposed wall if I am correct. On some more Water Dock further along I noticed a colony of aphids. It is often not hard to identify aphids when you see a colony on a particular species of plant. For this one I just searched with Google ‘aphids on dock’ and I was presented with two options: Aphis rumicis and Aphis fabae. Aphis rumicis is more plant-specific, being found on mainly dock and sometimes on rhubarb. Aphis fabae (the Black Bean Aphid), is much less so being found on a wide range of vegetables. Unfortunately the two are quite similar, although I am leaning towards A. fabae due to the paler legs shown in many of the photos I have seen on this species. My 50th hemipteroid (bug) for my Pan-species List! In my (not great) photo, the colony appears to be being attended by a Lasius ant. Suddenly the sun emerged from behind the clouds and everything seemed to suddenly wake up. There were loads of umbellifers on the lake shore which were great for invertebrates although I had little time to examine them closely. What I did find, however, is a mini-miner. These are very tiny bees in the genus Andrena, which I don’t come across too often. Their larger relatives in the same genus I more often come across. There are 10 mini-miner species compared to 57 other Andrena species, although I find them much harder to identify. Also, many of them have very restricted distributions. I potted this tiny bee and when I arrived back home I took a few hasty shots though the gap between the lid and the pot. The long, very white hair caught my eye and helped me when I attempted to identify it using Steven Falk’s Field Guide to the Bees of Great Britain and Ireland. Currently I think the most likely species is Andrena niveata, the Long-fringed Mini-miner. Modern records are restricted to South-east England and it is not very common, therefore I am tentative with my identification and I will hopefully get it checked under the microscope or with an expert. In the book it says: ‘the body hairs are much whiter than in other mini-miners…the overall effect is thus of a very silvery, strongly marked mini-miner’. This definitely fits my bee. I was very pleased with the number of interesting and new species that I found this morning, given the short amount of time and the unfavourable weather conditions. I can’t wait until the summer holidays when there will be more time to explore! Bees and Barberries: A Match Made in (Bee) Heaven! 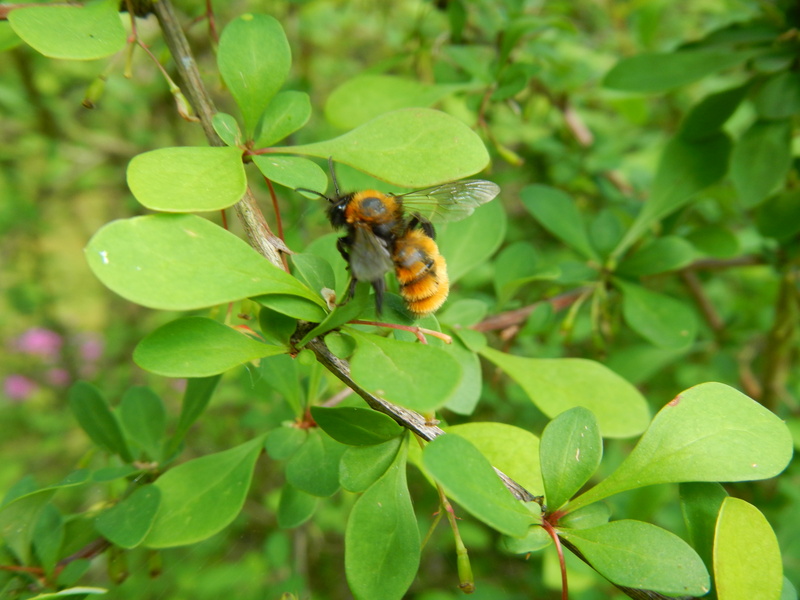 We have a Barberry in our back garden which seems to be incredibly good for bees! I have recorded 9 bee species on it so far: Buff-tailed Bumblebee; White-tailed Bumblebee; Garden Bumblebee; Common Carder Bee; Tree Bumblebee; Early Bumblebee; Honey Bee; Yellow-legged Mining Bee and, my favourite, a Tawny Mining Bee just yesterday!